Owen Dwyer of the Peewee AE Stars fires a shot on net during Saturday's game at the SPC. Photo by Adam Prudhomme. The Napanee Novice BB Stars were defeated 5-3 by Ennismore on home ice on Saturday. 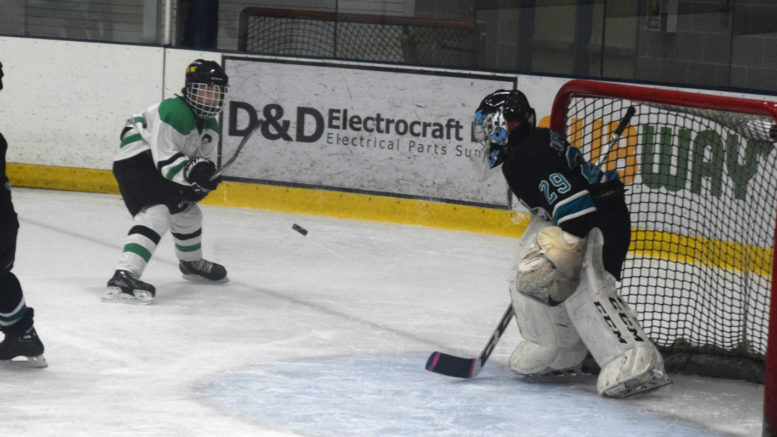 The locals gave up late goals in both of the first two periods, one with three seconds left in the first, and another with 13 seconds remaining in the second. Down 4-0 after two periods, Dawson Chalk fed the puck to Mason Whalen who slid it past the goalie. Half way through the third, Keagan York scored on the power-play, with assists to Whalen and Liam Mulder. The teams traded goals from there- Chalk scored in the last minute. Shots were 24-22 in favour of the locals. Sunday, the six team round robin continued with the Novice Stars defeating Prince Edward County 4-1. After spotting their guests one, Chalk picked up Hudson Conger’s rebound to even the score, before Camden Arthur got the winner, just over the goal line, and added a highlight reel goal from centre ice with a fine deke to complete the play. York added another in support of Matthew Traver’s win. -The Peewee AE Stars narrowly defeated Lindsay 3-2 in Game 3 to complete their second sweep in a row during playdowns. They had continued their strong play in Game 2 facing Lindsay to win 13-4 at the SPC. Carter Slaven and Owen Kish each had five goals. Nate Vanberkel, Jacob Cox, and Noah Nugent netted the others. Next up is a series with Oro, a town beyond Barrie. -The Napanee L&A Mutual Insurance Atom AEs got a convincing 5-0 win on Sunday over Lindsay to advance in playdowns, after they had tied the series at four points each with a 4-2 road victory on Saturday to force a fifth game. Neither team had managed a home win, so the pressure was on the team at the SPC. Wes Davey got the first of two when he flipped a high shot over the goalie’s head and glove. Cooper Seaton also had a pair- one on a power play breakaway, and one on a wraparound. Zachary Wilde also scored, while Cruz Maracle had two assists and Oliver Kimmett had one. They were dominant with shots on goal 31-9 in their favour. In a must win on Saturday, Seaton scored twice while William Babcock and Maracle tallied singles. Carter Cork earned Sunday’s shutout and Jack Richer was the winning goaltender on Saturday.